10. Lifebloom ticks after applying each stack individually, but doesn't tick on refreshing it. This is a comprehensive list that I have compiled for healing during Deep Corruption in Heroic Mode Yor'sahj the Unsleeping, when the boss absorbs a Shadowed Globule. It seemed easier to compile this information rather than add it piecemeal to previous posts. It is organized by class (healing classes first), and each class section lists abilities giving NO stacks first, then 1 or more stacks; raid wipers are listed at the end of each section! Keep in mind that all direct heals will add 1 stack of Deep Corruption. Direct heals are not listed below for that reason. Deep Corruption lasts 25 seconds in Heroic Mode, and after those 25 seconds is reset and refreshed. This results in a total of two 25-second debuffs per phase where Shadowed Globule is absorbed. Adding stacks WILL NOT extend the timer; therefore if someone has 3 stacks with 5 seconds left (for example), those stacks will be wiped clean after 5 seconds even if he/she receives more heals before the debuff expires. Frenzied Regeneration gives no stacks, even with Item - Druid T13 Feral 4P Bonus (Might of Ursoc and Stampede). Swiftmend gives 1 stack, but gives no stacks. Rejuvenation gives 1 stack for the initial cast only, not for ticks. Wild Growth gives 1 stack per person healed. Lifebloom gives 1 stack per cast, no stacks for Bloom instant heal, no stacks for ticks and no extra stacks when lengthened by /Regrowth/ with talented (although the heal used to extend it will add a stack). Heals received via Beacon of Light give no stacks. Lay on Hands gives no stacks. Divine Storm gives no stacks. Divine Shield does not clear stacks, and does not prevent further stacks from being generated. Light of Dawn gives 1 stack per person healed. Desperate Prayer gives no stacks. Mastery: Echo of Light gives no stacks (Holy Priest Mastery). Guardian Spirit gives no stacks. Prayer of Mending gives no stacks. Vampiric Embrace gives no stacks (Shadow Spec). Power Word: Barrier gives no stacks. Prayer of Healing gives 1 stack. Penance gives 1 stack per channel (not per tick). Power Word: Shield gives 1 stack, even without Charred Glyph. Binding Heal gives 1 stack to the target and 1 stack to the caster. Holy Word: Sanctify gives 1 stack per target healed. Renew gives 1 stack for initial cast only, no stacks for ticks and no extra stacks when lengthened by Serenity (although the direct heal used to extend it will add a stack). Atonement gives 1 stack per heal, including 1 stack per tick of Holy Fire (Raid Wiper!). Earth Shield gives no stacks. Healing Stream Totem gives no stacks. Spirit Link Totem gives no stacks. Heals from Feral Spirit give no stacks. with Charred Glyph gives no stacks. gives no stacks, although Unleash Life will give 1 stack. Chain Heal gives 1 stack per person healed. Healing Rain gives 1 stack, and 1 extra stack each time a player leaves and re-enters the AoE heal. Riptide gives 1 stack for the initial cast, not for ticks. Death Strike and Mastery: Blood Shield (Blood DK Mastery) give no stacks. Death Pact gives no stacks. Anti-Magic Shell gives no stacks. gives no stacks, even with Charred Glyph. Using followed by Death Coil gives no stacks. Chimaera Shot gives no stacks. Evocation with Charred Glyph gives no stacks. Incanter's Flow gives no stacks. Ice Block does not clear stacks. Mortal Coil gives no stacks. Victory Rush with gives no stacks. Grounded Plasma Shield (Engineering Tinker) gives no stacks. Mythical Healing Potion, and other health potions give no stacks. Dense Embersilk Bandage, and other bandages give no stacks. Gift of the Naaru (Draenei Racial) gives 1 stack on initial cast, not for ticks. When the boss was current content, he had spells that required a full raid group to coordinate and deal with appropriately. Like Deep Corruption blowing up the entire raid when healers mess up, or Digestive Acid encouraging spreading to minimize damage. Now, he is the definition of another Raider's Training Dummy when being soloed. Every spell in his arsenal is gimped. Void Bolt is the only real spell you should be concerned with, and hence why Glowing Blood of Shu'ma is the only relatively "threatening" blood spell in the bunch. Shadowed Blood of Shu'ma: Deep Corruption only hurts you when you directly heal yourself too many times. 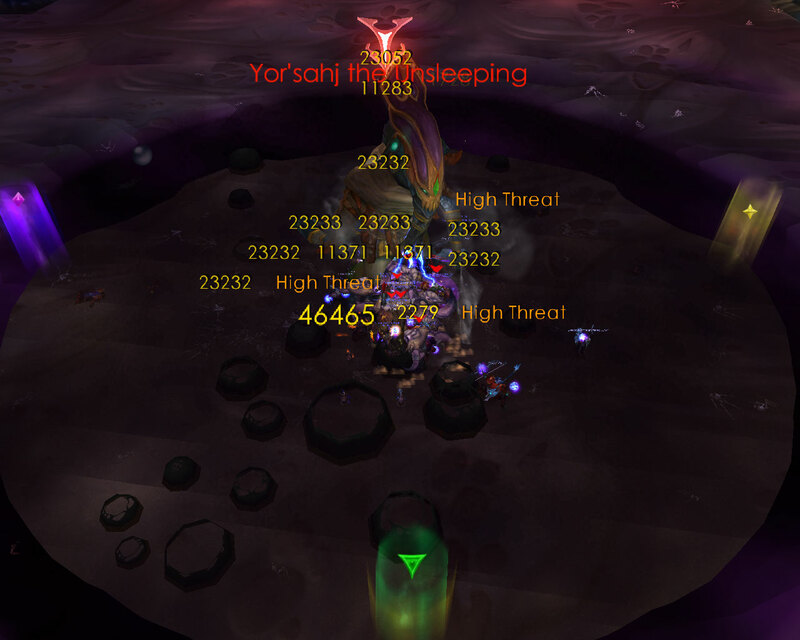 Most solo friendly "healing" will not trigger Deep Corruption, and the damage from the explosion is minimal in a solo environment, even on 25 Heroic, even for dedicated healers. Black Blood of Shu'ma: Forgotten One are common and weak when killed in small packs. By this point, they die in a rush to not even be a mild "threat". Glowing Blood of Shu'ma: The only relatively threatening spell, increasing melee haste and Void Bolt spam goes up, which is about all this spell can do. Cobalt Blood of Shu'ma: A good amount of classes and specs don't even have mana, so Mana Void cannot use Mana Void effectively, and some classes can bounce back after losing mana really quickly. Crimson Blood of Shu'ma: You are comfortable with standing in the middle of the room and doing nothing by this point, Searing Blood is worthless and does hardly any damage. Acidic Blood of Shu'ma: Nobody else can be hit by Digestive Acid, so you take a small amount of damage which you can easily bounce back from. Garalon and maybe Tortos/Dark Animus are more modern examples of bosses afflicted by "The Yor'Sahj Effect" when being soloed. Yor'sahj the Unsleeping yells: Ak'agthshi ma uhnish, ak'uq shg'cul vwahuhn! H'iwn iggksh Phquathi gag OOU KAAXTH SHUUL! Yor'sahj the Unsleeping yells: Ez, Shuul'wah! Sk'woth'gl yu'gaz yoh'ghyl iilth! Yor'sahj the Unsleeping yells: Iilth qi'uothk shn'ma yeh'glu Shath'Yar! H'IWN IILTH! Yor'sahj the Unsleeping yells: KYTH ag'xig yyg'far IIQAATH ONGG! Yor'sahj the Unsleeping yells: UULL lwhuk H'IWN! Yor'sahj the Unsleeping whispers: O, Deathwing! Your faithful servant has failed you! Yor'sahj the Unsleeping whispers: Our numbers are endless, our power beyond reckoning! All who oppose the Destroyer will DIE A THOUSAND DEATHS! Yor'sahj the Unsleeping whispers: SEE how we pour from the CURSED EARTH! Yor'sahj the Unsleeping whispers: The DARKNESS devours ALL! Yor'sahj the Unsleeping whispers: You will drown in the blood of the Old Gods! ALL OF YOU! Void Bolt – Yor'sahj the Unsleeping blasts his primary target with dark energy, dealing 56 Shadow damage initially and then 4 Shadow damage every 2 seconds. This effect stacks. Fusing Vapors – The blood globules emit a fusing vapor when damaged below 50% health that heals all other active globules for 5% of their maximum life. Glowing Globule – When a Glowing Globule reaches Yor'sahj, it infuses Yor'sahj with the Glowing Blood of Shu'ma. Glowing Blood of Shu'ma – Yor'sahj's Void Bolt now hits all nearby targets for 22 Shadow damage in addition to the primary target component, Yor'sahj uses his abilities twice as often, and his attack speed increases by 50%. Cobalt Globule – When a Cobalt Globule reaches Yor'sahj, it infuses Yor'sahj with the ability to summon Mana Voids. Mana Void – A Mana Void leeches all the mana from every ranged spell caster and healer, storing the mana within itself. Destroying the Mana Void evenly returns the total of the leeched mana via Mana Diffusion to players within 30 yards. Mana Void – A Mana Void leeches all the mana from every ranged spell caster and healer, storing the mana within itself. Destroying the Mana Void evenly returns the total of the leeched mana via Mana Diffusion to players within 100 yards. Crimson Globule – When a Crimson Globule reaches Yor'sahj, it infuses Yor'sahj with the Searing Blood ability. Searing Blood – Yor'sahj sears the blood of three random players, inflicting a base of 22 Fire damage. The further the target stands from Yor'sahj, the greater shock received from the blast. Dark Globule – When a Dark Globule reaches Yor'sahj, the corruption of the blood seeps out into the Maw of Shu'ma. This vile corruption then periodically creates Forgotten Ones that attack the players. Forgotten One – These creatures fixate on a random target. Psychic Slice – The Forgotten One emits a wave of psychic force at its current target, inflicting 22 Shadow damage. Acidic Globule – When an Acidic Globule reaches Yor'sahj, the Maw of Shu'ma infuses with the acidic blood and stimulates further Digestive Acid production. Digestive Acid – Digestive Acid periodically secretes from the stomach lining, inflicting 37 Nature damage to a player and nearby allies within 4 yards. Digestive Acid – Digestive Acid periodically secretes from the stomach lining, inflicting 37 Nature damage to a random player. Shadowed Globule – When a Shadowed Globule reaches Yor'sahj, it infuses Yor'sahj with the Deep Corruption ability. Deep Corruption – Yor'sahj's Deep Corruption spreads to every player, causing every fifth healing or absorption effect cast on a player to trigger a violent detonation, inflicting 42 Shadow damage to all players.